The term “Freehold:” is derived from an English legal term describing fee-simple property ownership. Freehold Borough was incorporated as a town on March 25, 1879, and reincorporated on April 15, 1919, as a separate municipality from Freehold Township. The Lenni Lenape Native Americans were among the earliest settlers in the area. Scottish immigrants also settled here to avoid religious persecution in Scotland. The Borough of Freehold was designated as the County Seat, and a Count Courthouse was opened in 1715. During the Revolutionary War, Freehold was known as a center of patriot activity. In 1778 the British Army evacuated the city of Philadelphia and were marching toward New York City. However, they were intercepted by the Continental Army in Freehold, and that Battle of Monmouth became one of the largest battles of the Revolutionary War. 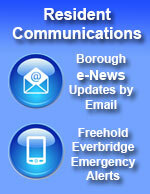 The Borough has a land area of 1.9 square miles, and a current population of 12,047 people. The Borough is rich in many historical attractions dating back to the Revolutionary War era. Lovely Victorian style homes sit on shady tree-lined streets. In 1824, the American Hotel opened on West Main St., where it still stands today, as does the Freehold Racetrack which opened in 1853. Downtown Freehold has experienced a renaissance in recent years with the addition of brick sidewalks. Downtown Freehold features many fine restaurants and shops, and is frequently the site for outdoor concerts, parades, athletic events, a summertime farmers’ market, and many other events. Freehold Borough is governed under the Borough form of New Jersey Municipal Government, consisting of a Mayor and six Council Members. Today, J. Nolan Higgins serves as Mayor, along with Council Members Michael DiBenedetto, Kevin Kane, Ronald Griffiths, George Schnurr, Sharon Shutzer, and Jaye Sims.